Herald on the Bay: A waterfront site meant economical newsprint delivery by barge. Extreme Casino: Genting Resorts World invited Miamians to imagine this redevelopment of the Herald site. Staff Only, Please: You can see this view of Biscayne Bay only if you work at the Miami Herald. Critics say the building blocks the waterfront. The other big debate today is about the Miami Herald's maybe historic (but maybe not) bay front headquarters and what its new owners, Genting Resorts World, will be allowed to do with it. At 2 p. m. today, Miami's Historic Environmental Preservation board will consider Dade Heritage Trust's application to apply an historic designation to the building. That would radically limit Genting's options as it strives to develop a resort casino on a site its protectors contend is rich with Miami civic history. It wouldn't bar a casino on the property, but the casino would have to be contained within One Herald Plaza's preserved exterior. The designation effort is shaping up as a familiar clash between business interests who want the building gone and belittle its value, and architects, historians and preservationists trying to save pieces of the history of a city best known for tearing that history down. But that effort comes with a twist: The building in question is a very large, and not universally beloved, example of a mid-20th Century style of Miami architecture that until recently enjoyed little popular favor. Arguments for preserving the building: It's an example, though not a perfect example, of Miami Modern ("MiMo") architecture. And it's where the once-powerful Herald and its mythic leaders held court and directed news coverage that earned the newspaper 19 Pulitzer prizes. 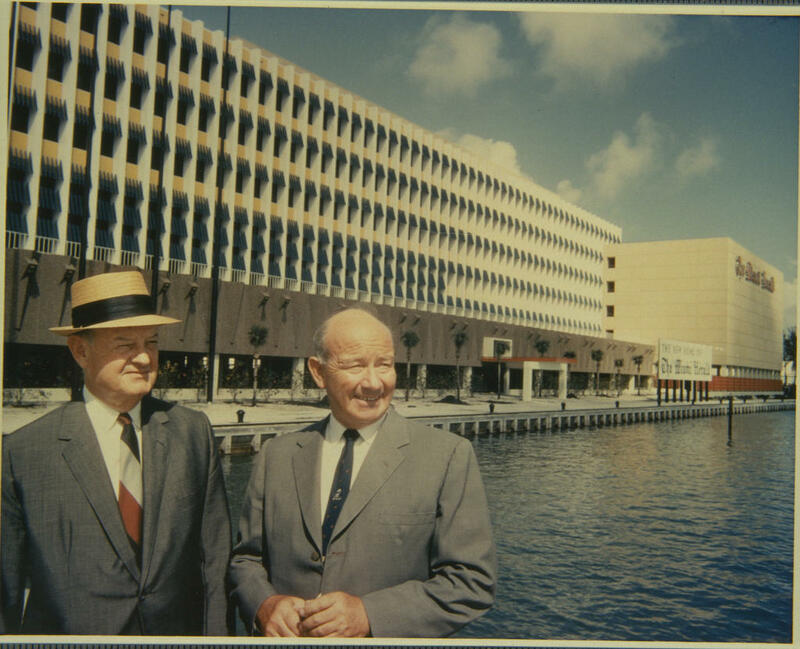 Mythic Leaders: John S., left, and James L. Knight at their new building on Biscayne Bay. John bought the Herald in 1937. Arguments against: It’s ugly, despite its architectural pedigree. It's configured in a way that's suitable for running and printing a newspaper and nothing else. It blocks public access to the waterfront. And, apart from the merits, advocates say, the preservation argument is really just an anti-casino campaign. The Dade Heritage Trust is leading the historic preservation campaign. It will make its arguments at a public hearing at 2 p. m. at Miami City Hall. But it’s only round one. A final decision is expected before the end of the year. The Herald, meanwhile, is in its last months of tenancy in the building it’s occupied since 1963. After enjoying more than a year of free rent since Genting purchased One Herald Plaza for $236 million, the newspaper will be moving to new headquarters in Doral next year and is not taking a public position on the preservation dispute.